Confido Advisors, created in 2002, provides South Korean investors with research and investment opportunities on overseas Alternative Investments. 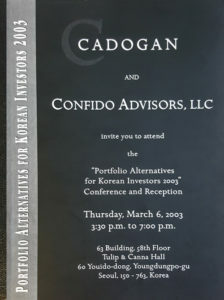 In 2003, Confido Advisors hosted the first ever alternative investments conference held in Korea titled, “Portfolio Alternatives for Korean investors”. This significant event was televised and written up in the Korean media. More than 70 Institutional Investors attended. The demand for knowledge on overseas alternative investments was so strong that Confido Advisors over the following years, arranged more than 100 investment conferences, investor forums and seminars discussing various strategies and sectors of overseas alternative investments. Confido Advisors also organized 10 alternative investments summits in Jeju Island where investors participated in educational workshops, presentations and one on one interactions with leading academics, professors and investment researchers discussing overseas alternative investments. As the demand for overseas alternative investments has grown, Korean investors travel frequently to the USA for onsite due diligence meetings with investment managers. Confido Advisors has been deeply involved in arranging meetings with institutional quality fund managers. For the past 15 years, Confido Advisors has travelled to Korea once per month to meet with investors and discuss the outlook for markets, investment strategies and to gain a better understanding of Korean investor’s goals and objectives. Confido Advisors was engaged by a major Korean Financial Conglomerate to form a Global Investment Advisory Council. Confido Advisors reached out to 12 Global asset owners and invited them to join the Council, which they did. Confido Advisors engaged a prestigious New York Law Firm to form the bylaws and guidelines for the Council. Having successfully established the Global Investment Advisory Council, Confido Advisors administered the Council for 4 years organizing bi-annual meetings in Korea and New York, regular conference calls and various other interactions between the members and Korean investors. Confido Advisors Partnered with a top tier Korean Bank to launch a US focused Fund and worked with its Chairman and the head of their Wealth Management division. Confido Advisors has introduced numerous fund managers specializing in various alternative investment strategies such as infrastructure, renewable energy, real estate equity and debt, IoT (Internet of Things), cyber security, healthcare, medical devices, education, private equity, venture capital, direct lending, mortgage securities and investment grade convertible bonds and public equities. South Korean investors have invested billions with these managers. In 2009, Korean Financial Regulators implemented the Capital Markets Consolidation Act overhauling financial regulation and setting the stage for significant reform. In addition, Korean Government implemented a series of measures over the past several years to deregulate overseas investments. This has made it possible for Korean investors to invest more actively overseas. 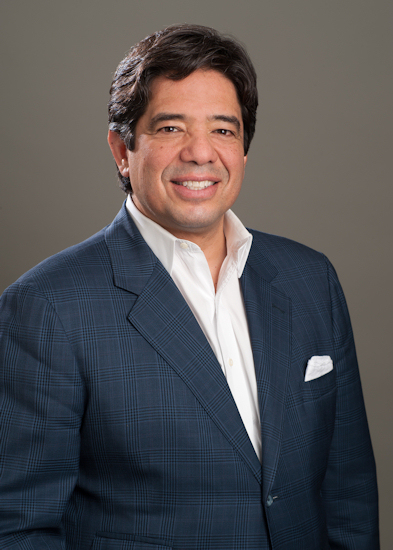 John Rodriguez, Chief Executive Officer / Founder of Confido Advisors enjoys the distinction of a successful 37-year career on Wall Street. Having worked at Solomon Brothers and Drexel Burnham’s Institutional Proprietary Trading Desks during the 1980’s, he then became a member and specialist on the New York Stock Exchange. Later he ran the International trading Desks for British Merchant Bank-Barings and also Daiwa Securities in New York. During the 1990’s, Mr. Rodriguez enlisted world renowned Nobel Prize Winner, Harry Markowitz, PhD. to develop and promote a Global Investment Fund for Chilean Pension Funds, which successfully raised $400Million. Then, as the Head of Investor Relations for a division of Credit Suisse Private Bank, Mr. Rodriguez served as Advisor and Consultant to non-US Institutions including Kuwait Sovereign fund and other non US institutions as well as Ultra High Net Worth clients around the world. Currently, Mr. Rodriguez is serving Institutional, Corporate and other Ultra High Net worth Investors in Seoul Korea and abroad with Advisory and consulting services associated with successful investing in portfolio alternatives and direct projects.